This is the last of the ARC’s that I needed to review. Whew! Now I can slack off for a bit (but I probably won’t – y’all know me by now!). A couple of things before we begin. First, I have to say that this is not the usual thing I read. Second, I did not read the first book in this series, which is called Touchstone. According to GoodReads, these are supposed to be two standalone books, but I think it probably would have been helpful to know more about the character’s back story in order to enjoy this one. Not that I didn’t enjoy it, but . . . well, you’ll see. 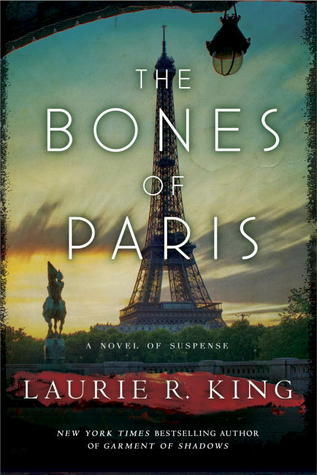 The Bones of Paris is the story of Harris Stuyvesant, an American private detective living in Paris in the late 1920’s. He is hired to find Phillipa Crosby, a young woman who was living in Paris but hasn’t been in contact with her family. They want to make sure that she is okay. In a twist of fate, Harris had a fling with Phillipa (who he calls Pip) a few months back. He takes the job, but soon realizes that it will be a lot harder than he thought. It is clear from the beginning that Pip did not just disappear or take a trip without telling her parents – she was murdered. As Harris investigates further, we find out that Pip was involved with a group of artists who celebrate the violent and grotesque. There’s Man Ray, a photographer who Pip modeled for, who had a fascination with the large burn scar on Pip’s side. There’s Didi Moreau, an artist who likes to use bones in his work, some of them human. And then there’s Charmentier, a patron of these forms of art, including the Grand-Guignol theater, which puts on horrific plays and comedies. While Pip was known to have dealings with all three men, and many others who associate with them, Harris runs into dead end after dead end. Everyone seems to remember Pip, but no one knows where she has gone. The story gets even more complicated when an old lover, Sarah Gray, enters the story as the newly hired assistant to Charmentier. Sarah’s brother Bennett is soon called in to help, since he has a gift of intuition that almost seems psychic due to a near death experience in the war. The main complaint I had with this book is that the first part moves very, very slowly. Not that it’s boring by any means, but there is a lot of plot and setting to set up. King has done her homework – the images of Paris in 1929 are very visual and very well done. It was also really nice to see people like Ernest Hemingway and Cole Porter, both of whom were known to frequent Paris during this time period. It gave the book a nice sense of realism and validity. However, there is a LOT of Harris wandering around showing people a picture of Pip and not getting very far. True, a lot of private detectives have this exact same experience, but it felt like it went on for a really long time. I will say that the last third of the book was incredibly gripping, and while the main bad guy was not a surprise, the means he uses and the reasons behind them are chilling, scary, and very well done. I would re-read this for the ending alone, because it is fabulous. I couldn’t put it down. I haven’t decided if I want to go back and read Touchstone, but I haven’t ruled it out either. It might help me understand Harris’s behavior in places and I would like to hear more of Bennett and Sarah’s stories. If I do read it, be sure that it will be reviewed here! So if you like a creepy, thrilling mystery set in an exotic and dangerous place, be sure to check this one out. When does the good part start? My Kindal puts me at 63% and I’m so bored I don’t care who done it or why! I generally like King’s books, this one disappoints. I won’t read the first one and probably won’t finish this one unless I’m stuck in an airport. I agree, it does move very slow. I had a hard time with most of the book, to be honest. It was probably the last quarter or so of the book where things really picked up, and then I couldn’t put it down. It wasn’t my favorite book that I read last year, that’s for sure. I decided against reading the first book.